Looking into Mutual of Omaha Medicare Supplement plan G? Choosing a Medicare insurance provider can be confusing and, as a Medicare recipient, you are faced with some options. Choosing a company, you trust to provide reliable; affordable coverage should be the goal. Mutual of Omaha has been in business for more than a century, providing seniors with Mutual of Omaha Medigap plans, including Mutual of Omaha Plan G.
As the sponsor of the beloved wildlife documentary series, Wild Kingdom, that began in the 1960s and continues online today, Mutual of Omaha is a household name with a reputation for customer service and corporate stability. Working with Mutual of Omaha is like working with an old friend for the many seniors who have used their products, including Mutual of Omaha Medicare Plan G and life insurance plans for much of their lives. Mutual of Omaha has been a trusted provider of financial services to customers for decades. When they began offering Mutual of Omaha Medicare Supplement plans, it is no wonder that plans like the Mutual of Omaha Medicare Supplement Plan G quickly became popular. Customers are loyal to Mutual of Omaha because they know that the company has their back, no matter what. Mutual of Omaha has evolved over the years to provide customers with the most up-to-date products on the market, while still offering the high level of service they are known for. Mutual of Omaha Medicare Supplemental plans provide the type of security and flexibility that today’s seniors are looking for in supplemental coverage. They can be used with any healthcare provider, anywhere in the county who accepts Medicare. No referrals needed and no questions asked. If your retirement dream is to travel the globe, there are Mutual of Omaha Medigap plans that will cover you outside the U.S.
Tom and June Bowman of San Jose were eagerly anticipating retirement but worried about health issues eating up their savings. Some friends introduced them to Medicare Supplement plans, policies that cover costs not paid by Original Medicare Part A and B. They were interested to hear that Medicare Plan G is currently the fastest growing plan, offering extensive, affordable coverage. According to their online research, Mutual of Omaha Plan G would cover nearly all of their medical expenses. The one cost that would not be covered by Plan G, though, is the Medicare Part B deductible ($183 in 2017). The Bowmans started to think that another Medicare Supplement plan, Plan F, might be best for them because it would cover all of their costs, including the Original Medicare Part B deductible. The rates for some of the Medicare Supplement Plan G policies were so much lower than the Plan F policy rates that they would pay less overall with a Mutual of Omaha Plan G policy. Medicare Plan G was the best plan for them do it its lower rate increases. 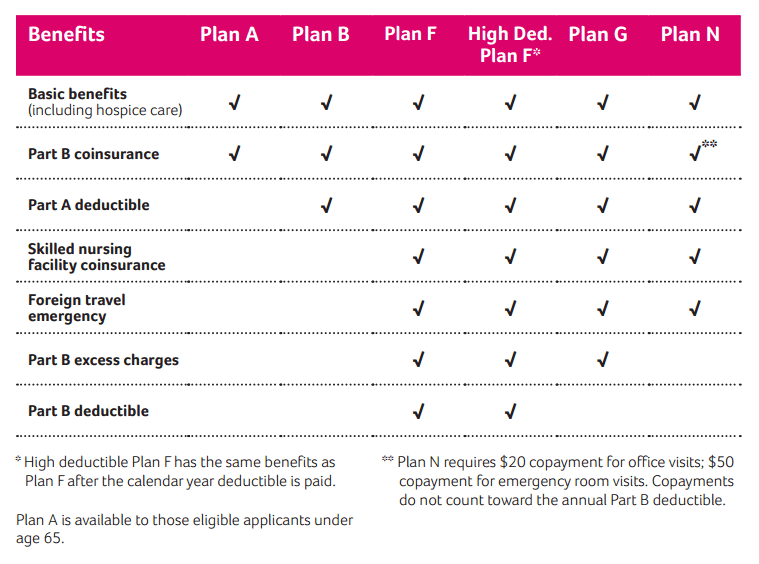 Plan N is also available but they saw more value in Plan G. Plan N has office visit co-pays that Plan G does not. Why Choose Mutual of Omaha’s Medicare Supplement Plan G? Medicare Supplement plans offer standardized benefits, so why choose a Mutual of Omaha Medicare Supplement Plan G over one from another company? Mutual of Omaha has decades of experience, the dedicated customer support and the state-of-the-art technology to provide you with the products and service you demand. Their rates for Mutual of Omaha Plan G are extremely competitive, and they offer unique benefits, which helps cover office visits and other medical care services. They also offer one of the most generous household discounts available. Unlike other insurance providers, Mutual of Omaha is owned by policyholders, not shareholders, meaning that their focus is 100% on you, the policyholder. The rates for Medicare Supplement plans can vary a lot from state to state, as Louella O’Connor found out when she began exploring retirement communities around the country. Louella knew she wanted a Medicare Supplement Plan G from Mutual of Omaha, so she enlisted the help of an agent to research quotes and compare costs in different states. A 67-year old, non-smoker, Louella want to get the best rate possible for her Plan G.
Is a Mutual of Omaha Medicare Supplement Plan G Right for You? When you purchase Medicare Supplement insurance, you are freeing yourself and your family from worrying about financial catastrophe if you should fall ill. What better company to trust with your health and your peace of mind than Mutual of Omaha? They have been a household name for more than a century, and countless seniors in all 50 states have chosen affordable, top-of-the-line Medicare Supplemental insurance policies offered by Mutual of Omaha.